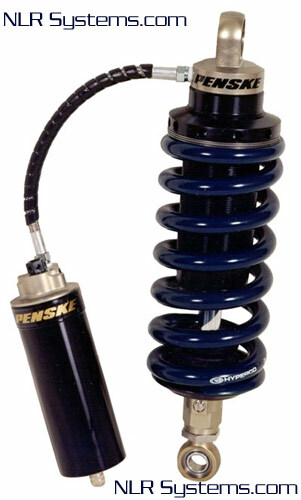 Thats right NLR now carries the full line up of penske racing shocks . Custom built drag shocks for $795.00 . These are the same shocks used by the quickest and fastest 60 inch bikes in the world. NLR and JRi working together to produce the ultimate drag shock. This shock is set up using custom valving specifically for NLR . If you've seen our bikes they are extremely smooth and and utilize full movement of the shock. This translates into quick et's and ultimate traction! Every aspect of these shocks are built with precision and the drag racer in mind. They are lighter, have more rebound control, swivel fitting connection for the reservoir and offer the excellence in service. Standard JRi shocks use a 5 inch spring. The NLR variant uses a 6 inch spring! The JRi MC/08 - Motorcycle Damper is custom designed and built specifically for the drag race market. This product is not a road race shock that has been modified to work on the drag strip. The MC/08 offers superior response time and control with JRi’s proprietary low friction bearing design and unique piston configurations. JRi’s piston design and very fine adjustment gives the perfect curve for drag strip, allowing superior launch characteristics, while maintaining grip all the way down the track. Order your NLR /Jri shock today! Price: 829.00 shipped to your door! 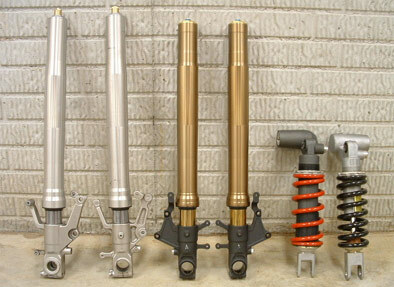 Modify your front forks by revalving the factory stock shock. Just ask around and you'll find out why NLR is the source for your suspension needs!